Fashionable lady will surely like to step out in style wearing this flattering blue colored art silk suit. This dress is beautified with embroidered work done as shown which is sure to match your choice. 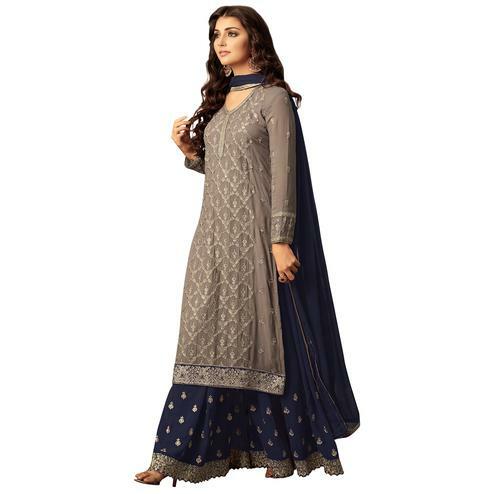 This semi-stitched suit comes along with santoon bottom and beautiful lace border net dupatta. Grab this suit and get it stitched in to churidar,salwar,palazzo or pant style suit according to your fit and comfort. This suit is lightweight and soft towards skin which is easy to carry all day long. Ideal for festivals & functions, office, casual outing, parties and social get together. Team this with a pair of matching earrings and heels for the perfect look. Get this dress now before it's gone out of stock.